The FirstRand Trans Africa Adventure is all about standing in the gap for children who through circumstance cannot help themselves. It is about using what is at your disposal to do what you can, with what you have. It is about inspiring people to do something for a cause greater than themselves and to inspire others to do similar work. The overall objective, to create a legacy by building a sustainable Education Fund that will finance the education costs of the current and future children of Ingane Yami children’s village. We wish firstly to thank our headline sponsor FirstRand who have drawn alongside us and said we want to make a difference by developing the Youth of our Country. They have done so openly and have given us the freedom to go out and create an event that has enabled us to multiply their generosity far more than we had ever hoped. To the riders who were asked to raise a minimum of R 20,000 each as part of their participation in the event, thank you for your efforts. To all the sponsors who have come on board and sponsored those riders – thank you for believing in them. To all the sponsors of products and services that made the event possible – thank you. To those private individuals who gave up their vehicles, allowed them to be covered in sponsor logos, driven over and through some tough African back roads, thank you for your generosity. To the support crew that nursed these vehicles and the riders through the two weeks this event would not have been possible without your selfless commitment and volunteering spirit. In 2017 our Cycling spin-a-thon raised R 280,000. Our target for R 2018 was R 850,000 but with a challenge to see if we could go beyond that and raise R 1 million. At time of writing a figure of R 1,2 million has been raised !!!! This is way beyond expectation and is testimony to what can be achieved when a group of people get together for a common cause that they are passionate about. In all R 2,630,000 to date – That just takes our breath away. Thank you Lord. The event commenced for the Durban based participants at Kloof Harvest church on Saturday 5th May, with a hand out of kit and packing of vehicles and cars. Karen Thomson and Harry Stott, riders from previous events, provided a rousing send off with words of encouragement from their hearts. Yvonne & Roger Greig founders of the Village and Kloof Harvest along with Scott Hamilton wished us well. The riders from Jo’burg (as they wished to be known) had set off that morning and would see us in Knysna on the Sunday evening. The Durban team gathered in Hillcrest at 3.30 am on the Sunday morning for the long 16 hour trek to Knysna. The first challenge for the Adventure team was to get all the kit, drinks and riders into the support vehicles and trailer. After an interesting illustration of team dynamics at work we set off on time. The trip itself was uneventful, but long, everyone starting to realise just how far this Adventure was taking us. We arrived in Knysna around 7.30 pm, were united with our JHB crew and were soon sat at a long dinner table in a Knsyna restaurant talking excitedly about what was to come. The next morning was at leisure, but the backup team were soon at work checking out the prologue route, looking for the best photo shoot points and planning the next day’s first stage. A 3.30 pm we gathered for our prologue stage around Knysna. This was to test the kit, the bikes, shake off those travelling cobwebs and take some drone video and images to be used in our event footage. The ceremonial handing out of the stage beads by Brad & Janine- the first bead reading the letter “T” and not the number “1” took the riders by surprise. The 20km took us via Leisure Isle where we met Dave & Wendy Gorven – generous sponsors of the Village and then a surprise visit to Nic Van Zyls (one of the riders) elderly parents. Pizza at a restaurant on Thesen Island and then off to early bed to prepare for Stage 1. A short drive into the Knysna forest to the Ysterhoutrug forest station. The start of our Adventure with words from Henry & Moira about Privilege. Day 1 has always been a really tough opener for the Adventure. This stage no exception, it was relatively short at 65km, but there was a tough and steep climb from the base of the Prince Alfred pass and into the little Karoo. It is probably Thomas Baines greatest work and is the longest publically accessible Mountain Pass in South Africa. It was an undulating stage, but the sting started at 35km where there was a 14km climb of 750m in ascent at an average gradient of 5,3% and into the Little Karoo. We passed over both the Outeniqua and the Langkloof mountains. We overnighted at Mountain Pastures – a remote game farm in the mountains. The highlights of the stage was the breathtaking scenery, Wiebe soldiering on with a broken gear shifter and Pieter Pretorius never say die attitude and not giving up. Our inspiring talk at the start was given by Sonja & Christo. A neutral zone for the first 10km, a beautiful climb through the Uniondale Gorge and then a magnificent view of the Swartberg and Little Karoo as we ventured off road for the day. Today the racing was on (who said this was no race?) and 94km to De Rust was covered in quick time. Bunch skills the order of the day and the racing snakes from Durban & Jo’burg showing themselves. A night at the House Martins guest lodge refreshed everyone - great hosts. The afternoon at the lodge had seen Ross Thomson taking up the bet to shave his legs - duly performed by Rob and R1000 was added to the fund raising kitty. Justin Bircher was the next victim with another R1000 being donated to the fund raising kitty by the riders. An inspiring talk by the two girls, Mich & Wendy about GRIT and then we were immediately onto a 25km climb which Criss-Crossed the Meirings River an incredible 25 times. A pass built once again by our man Baines. It bears a tough history of floods and landslides amongst incredible hardships, yet our engineers and road builders mastered the art of building a magnificent road through this awe-inspiring poort. The climb is not steep around 2% and passes through the fold mountains of the Swartberg. The stage was fast as it was all road and relatively short at 74km. Brad drove Alex (cameraman) to George for his flight home and picked up spares for Wiebe’s bike. He caught up with us back in Prince Albert. We got into Prince Albert early and this allowed the riders and support crew some R&R time to sort out washing, explore the town and rest up. Sam & Edgar provided the inspiring words for the morning and then it was the big tester - 1725m of climbing up the spectacular Swartberg pass with what proved to be a nasty detour down the road to Die Hell. Some riders raced, others stopped took photos and took in the magnitude of the mountains. The ride down was around 35 to 40 minutes of hot disc brakes and finding the apex of each corner. A truck and trailer lost its brakes on the way down and only due to Edgars quick thinking did it avoid taking out the landrover and Sam and his bike. The truck eventually crashed into the rock face. Fortunately no-one was injured. An early evening drive for the team up to the top of the ridge above the town to watch the sunset over the karoo was a great end to the day, followed by an exceptional dinner back at the Dennehof guest house. Ant & Wayne handed out the beads and led prayer. 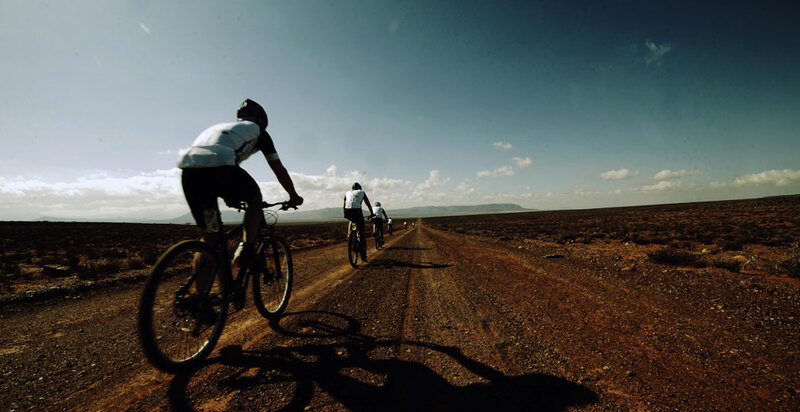 The stage was a 130km of peloton riding through the Great Karoo to the one horse town of Reitbron – The song for the day “horse with no-name” seemed appropriate. This was a day for the Rouliers. John broke a spoke, but the bush mechanics kept the bike rolling. The transit at the end took us to the Karoo National Park, where we had a great sighting of a pride of lions drinking near the game fence. Jackal and bush babies cried all night. A very early breakfast, and a long drive to the Buffels dam for the start of the big stage - 151km through Murraysburg, the Cambedoo reserve and down the escarpment to Graaff Reinet . On route to the start, the convoy startled a young kudu which ran headlong into the front wing of Christo’s vehicle. No one was hurt, the vehicle drivable, although R 31,000 damage done. Sadly the kudu suffered two broken legs and Christo had the brave but unenviable task of putting it out of its misery. It made everyone realise how quickly life can change. The two Pieters (Piet squared) led the morning talk and then it was a day for the riders to manage their bodies and their efforts and complete the stage. The reward, a night in the Drosty and dinner at the Polka restaurant which opened especially for us on the Sunday evening. A great evening as we knew it was followed by a rest day. The drama was not over though as the Land rover defender had suffered a broken compression pipe and was limping along. Dave Swart managed to have it fixed by a local garage – no thanks to Landrover or Ford and John found a bike repair shop at the general dealers who replaced his broken spoke. A late start, lazy breakfast, washing, bike repairs, catching up with the world and then a long 380km transit to Lady Grey and the Riverside Lodge. A severe contrast to the crisp linen of the Drosty. The weather up until now had been perfect with blue skies, cold mornings and lovely autumn temperatures in the day. We were now nearing the Southern Berg, a cold front had come through and there was snow on the high mountains. A short transit and then we stepped out into a strong ice cold head wind for what proved for many to be the hardest stage - almost 1900m of climbing on unceasing sharp climbs. Altitude was playing its part for the first time. The scenery was spectacular though as we skirted the foothills of the Berg. We were sent on our way by encouraging words from Nic & Sorin. Rhodes was a welcome sight, the cold weather cycling gear keeping us in the game. The rendition of Amazing Grace by Rob before the start of the stage left everyone in tears as Terry handed out the beads. Naude’s Nek, the great challenge for the day, built by the Naude brothers in the 1890’s, is the second highest dirt road pass in South Africa and the highest point we reached on Trans Africa. We started from Walkerbouts Inn, our overnight stop, at an elevation of 1817 metres and we climbed gradually steeper to the top of the Nek at 2587 metres. That’s 8500 feet above sea level. The morning temperature was minus two degrees and the cars were frozen up. We decided on a staggered start with 3 batches setting off at regular intervals. The idea to try and get everyone to crest the top of the pass together and finish closer together so that no one stood around in the cold. What a climb!!! A short transit to Matatiele. The trailer was taking strain with the rough roads and bush mechanics were again the order of the day. Christo had contacts in the town though and replacement parts were waiting for us. Craig and Steve joined us, with Craig pitching in as an additional support driver and Steve the new photographer. STAGE 9 R U Riding or R U Hidin? The Adventure was starting to bite - the scorpion’s tail as we had called it. Tired legs and sore bodies meant that each stage was just getting that bit tougher. This stage was 134 km, the second longest and from almost nowhere 1800m of climbing. The last 30km on the dirt to Penwarn was a slog and everyone had to dig deep. The highlights of the day were Wiebe’s and Ross profound words at the start, and the boerwors rolls provided by James, a farmer friend of Justin’s, out on route. The trailer was in trouble again and some of the bike racks had broken. More repairs. Stage 10 had always been about an 80km stage, but the option to ride out of Penwarn and make it 130km was tempting. We stuck with the 80km much to the relief of all as we had a time constraint in that we had a portage at the end and we needed to be at the Oaks for all the inbound supporters who would be staying with us the last night. Fraser and Dave motivated us and Dave share a testimony. It was a great stage, great weather, a tough climb out of the Creighton Valley, Will managed to go on a detour for a few kilometres, but we all got down the Umko valley safely. Ross rear hub gave up the ghost and he rushed off to PMB for a quick fix. The trailer detoured to Ixopo for more bolts (Thanks Pete and Craig). Fortunately there were enough supporters to enable us to commandeer spare racks, boots and seats to get us to the hotel. Almost 50 of us took over the Oaks that evening, Julian Cox was there to greet us and provide a vote of thanks to the support crew. John officially thanked everyone, Henry spoke on behalf of FirstRand and matching riding socks for the last day were handed out. Will & Justin had the honour of handing out the last beads and inspiring us. The beads finally spelling TRANSAFRICAN as that is what we had all become. This was no easy last day though, we had to navigate Brads Collar bone alley – which again caused drama with Mich falling and bashing her leg. We then had some interesting single track to navigate, keeping the group together and not to lose them was a challenge. Early morning light rain kept us edgy and the stage ended up about 7 km longer than we thought which meant a slightly late arrival at the village. Ant broke his chain twice just to add the final drama. Pieter – Mr Fix It was on hand though. The welcome at the village , as in past rides, was emotional, special, humbling. Jaco & Belinda from FirstRand were the surprise guests. Scott handled the proceedings and gifts were given to the support team and riders. The children gave out drawings and pictures they had made to each person which was a touching moment. Thanks to Tricia Deacon for organising the welcome and all the volunteers presents. Thanks Tricia for the inspiration cards that we handed out each evening. Every word and every picture connecting the stage, the songs and what we were riding for. Rob thanked all the supporters and families on behalf of the riders and we sang Amazing Grace once more. For the record 1132km of riding and 15060 meters of climbing - as measured by Johns bike garmin. The 2016 stats were similar. All readings from each rider were slightly different but this will suffice for the record!! Once again thank you sponsors, volunteers, riders, families and supporters. It was just a great team effort.